“The Spine” has gained a reputation for being one of the toughest challenges in the UK adventure-racing calendar, and with good reason – after all, running 268 miles along the Pennine Hills in winter in seven days is never going to be a walk in the park. 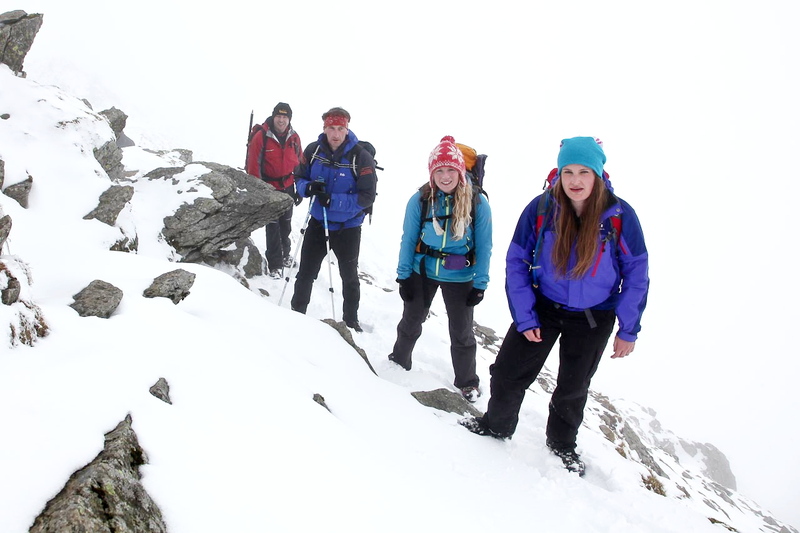 It’s also serious stuff for the support team – the young doctors are prepared to deal with everything from blisters to medical emergencies, and the gnarly hill-men may have to endure anything from blizzards to yet another round of tall tales in the pub! Getting the whole team together for a weekend R&R was always going to be difficult, especially for the young doctors working shifts. Medics Olivia and Naomi were free for a weekend of hill time, and gnarly hill-men rarely need an excuse, so Joe, John, Stuart and me joined them for a Lake District trip. 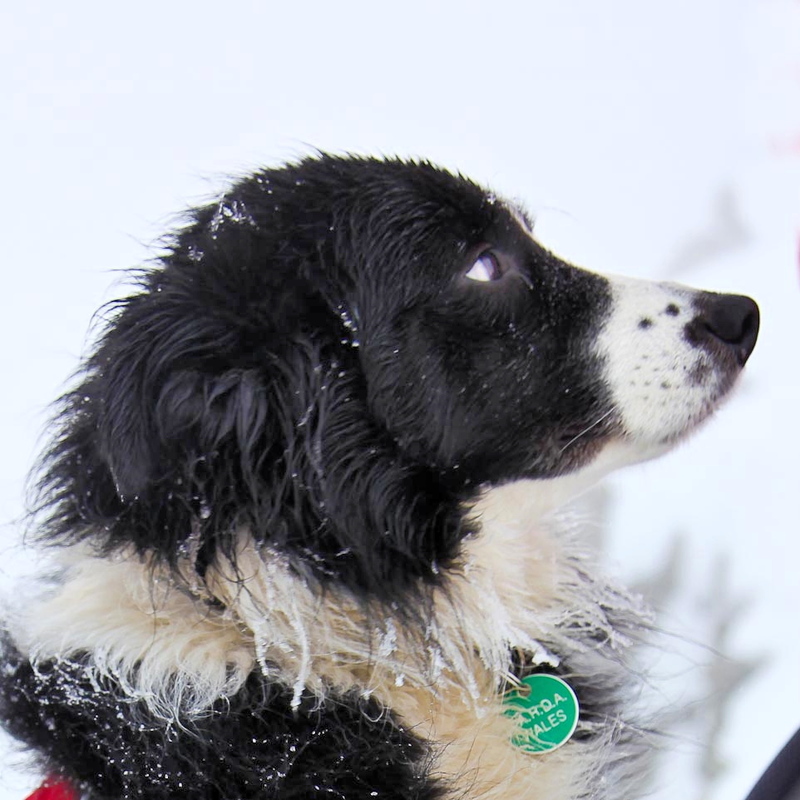 What we didn’t know as we swapped drinks and tall-tales in the White Lion at Patterdale, was that ‘Mr Snow’ was also going to make an appearance overnight. 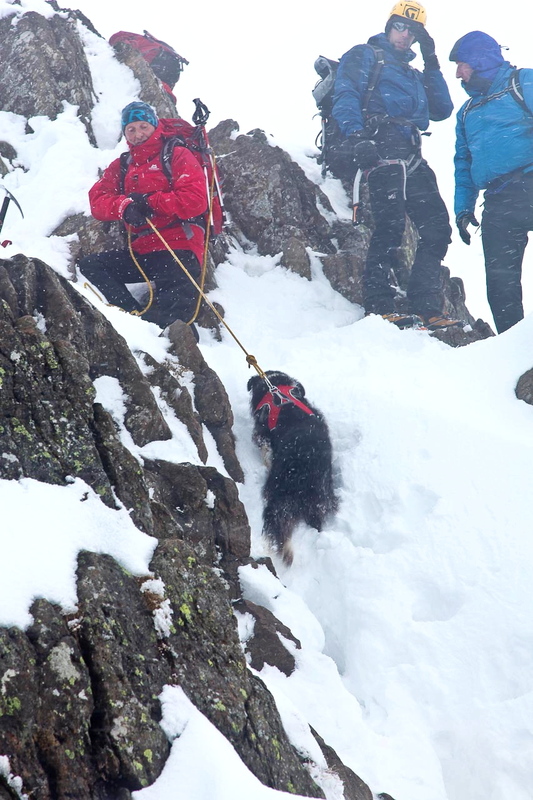 We had trudged up from Patterdale to the hole in the wall known as, simply, “Hole in th’ Wall”! From there onwards the fresh snow was deep and crisp and (sometimes) even. 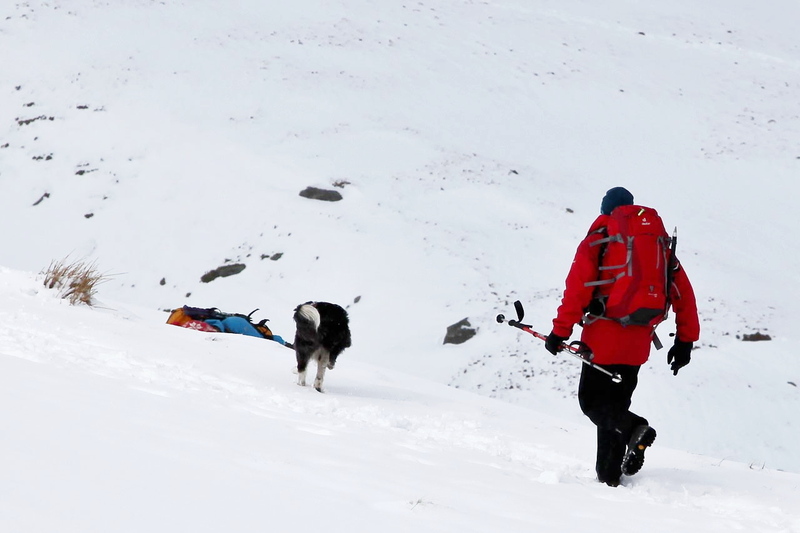 On the way to Red Tarn, I managed to persuade the gang that trainee search dog ’Mist’ would benefit from a few training runs in the snow. Naomi was volunteered to be the ‘body’ whilst the others wisely stood back and watched. 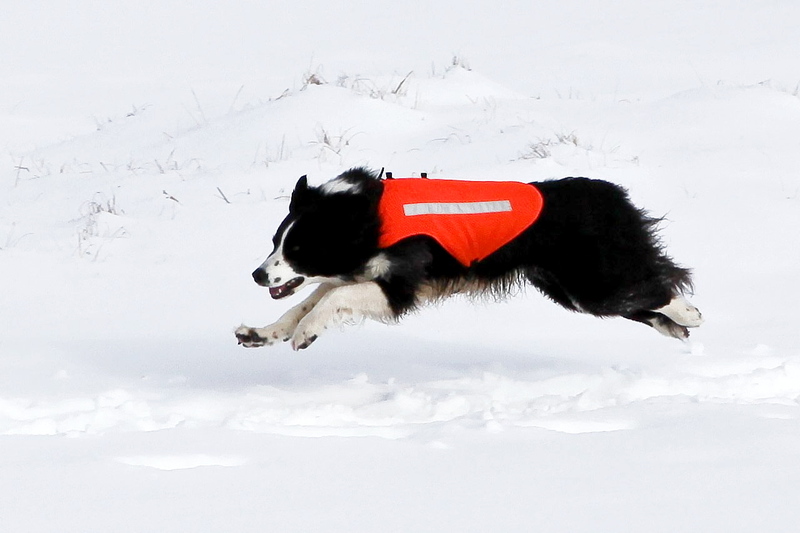 What the body sees – incoming search dog! 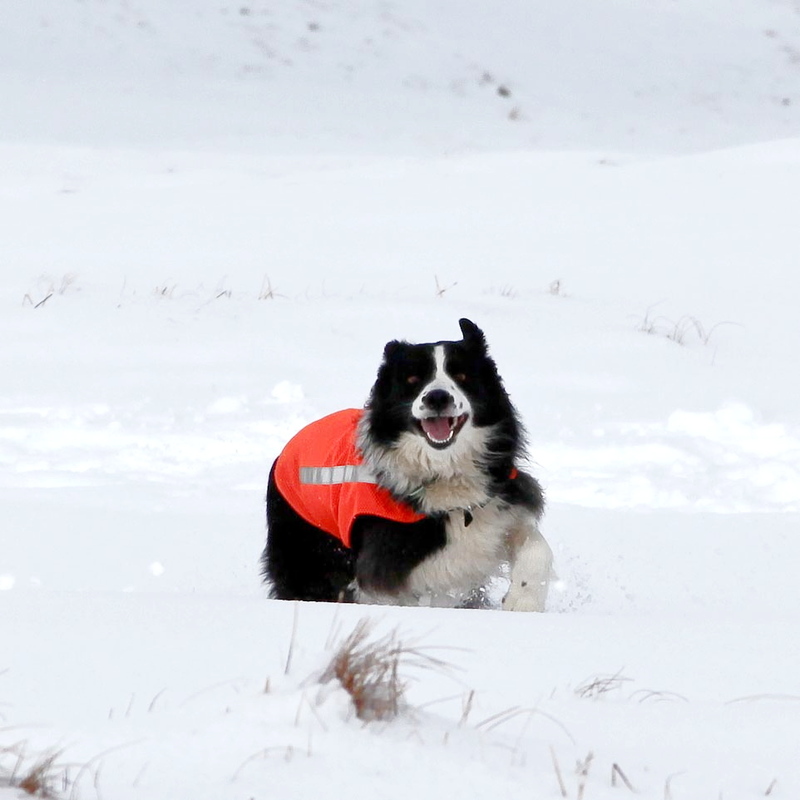 ‘Mist’ is currently in the early stages of training as a search dog – she sees the ‘body’ run away, and then follows a sequence where she goes to the body then returns to the handler, barking to indicate a find. She then shuttles between body and handler until all are together, job done. This sequence will be repeated for many weeks until the dog is conditioned to follow the same sequence every time, without fail. 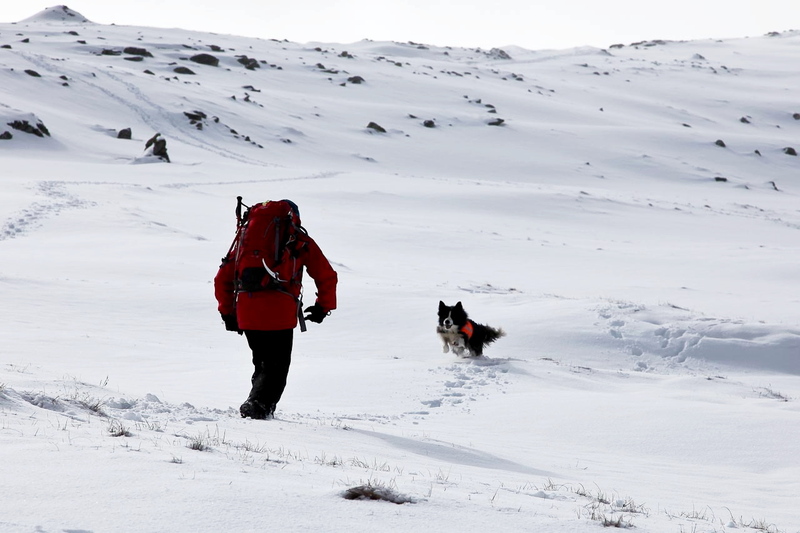 The deep snow was useful as an indicator of the dog’s determination to work through the sequence in difficult conditions – ‘Mist’ is big for a Border Collie at 19 kgs, and she used her size and strength to power through the snow, and I did my best to keep up, encumbered by a winter weight rucksack! 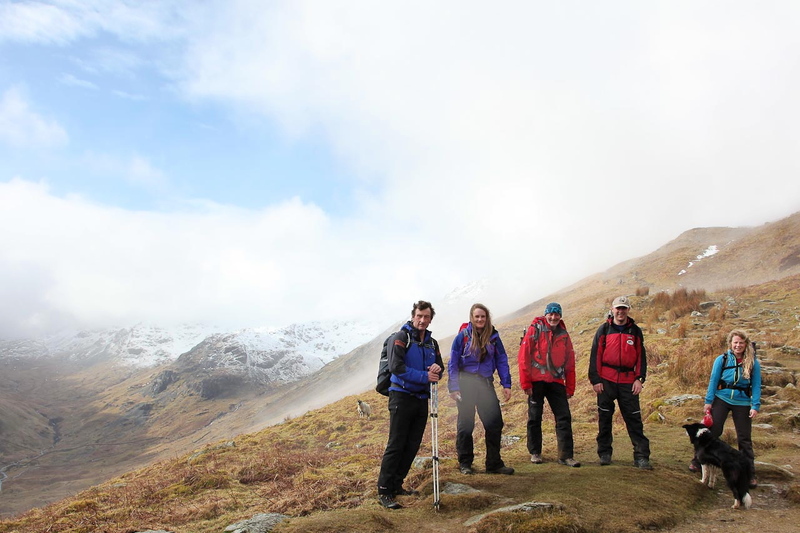 Having completed three ‘first-class’ runs, it was then time to get on with the real programme for the day – the circuit of Swirral Edge, Helvellyn summit and Striding Edge. 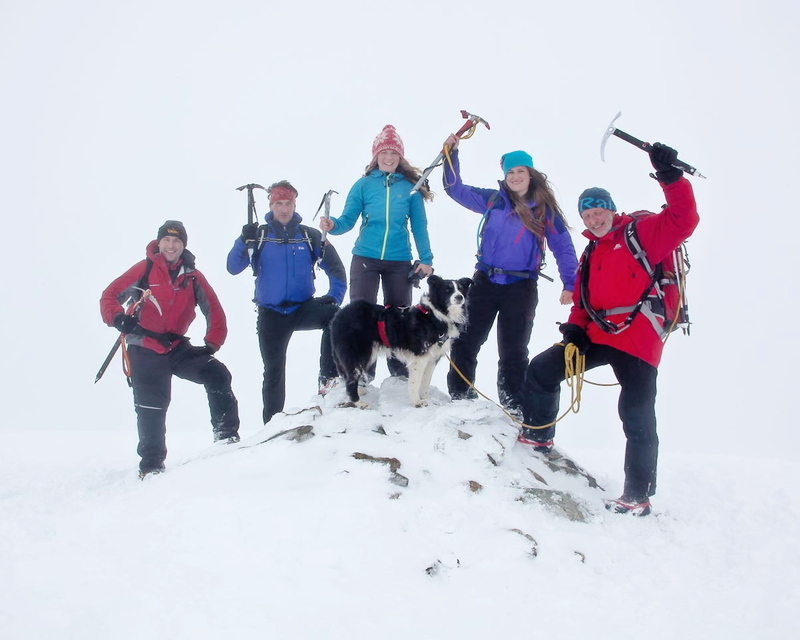 I’ve written about this route in winter before (see post #12) – in summer the Edges are popular walking routes, but in winter they are more of a mountaineering challenge. 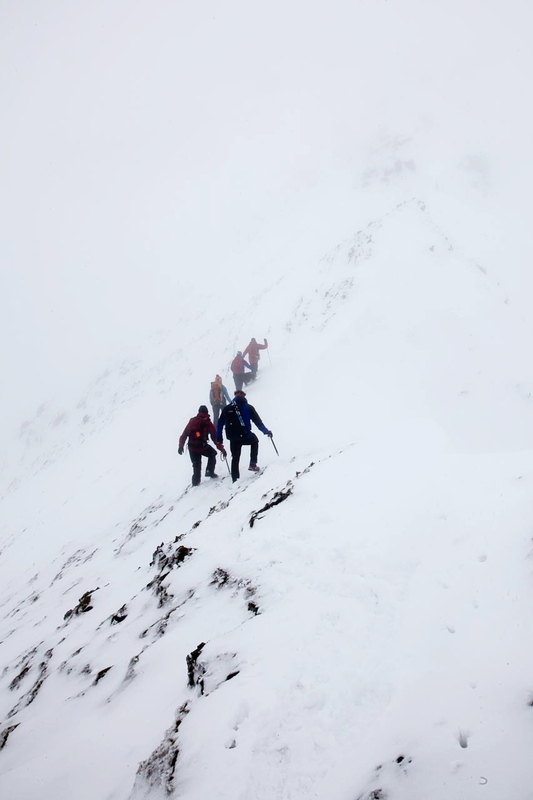 Today was no exception, though in the mountains it can be different each time you go out. 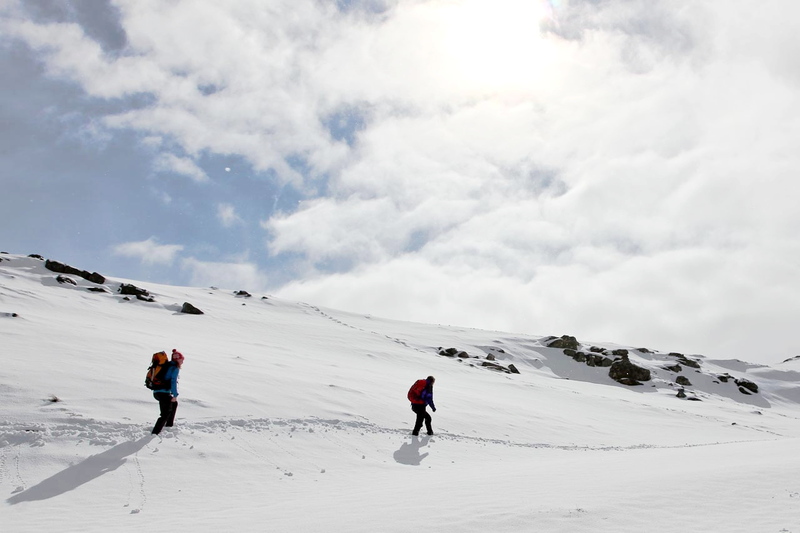 We had knee-deep fresh snow to contend with, requiring trail breaking as well as route finding skills. 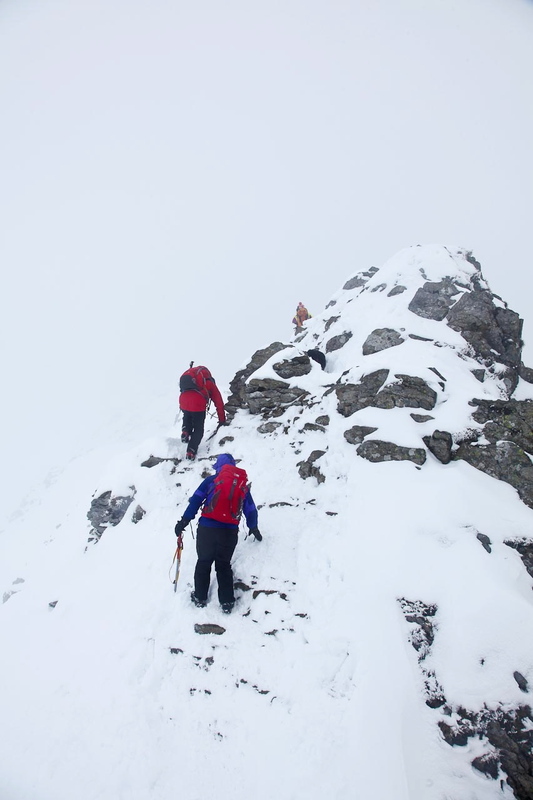 Steeper near the top …. 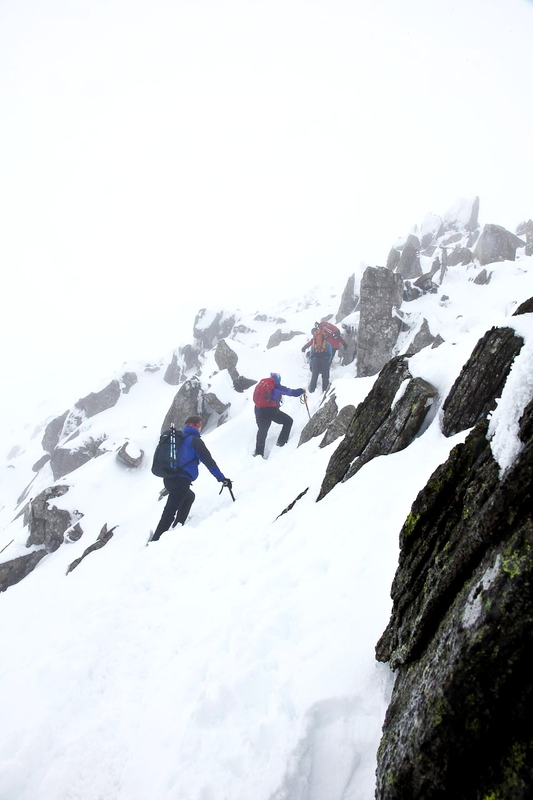 My preference in snow conditions is to go up Swirral Edge and down Striding Edge – this way the steeper (and possibly technical) sections are done in ascent. 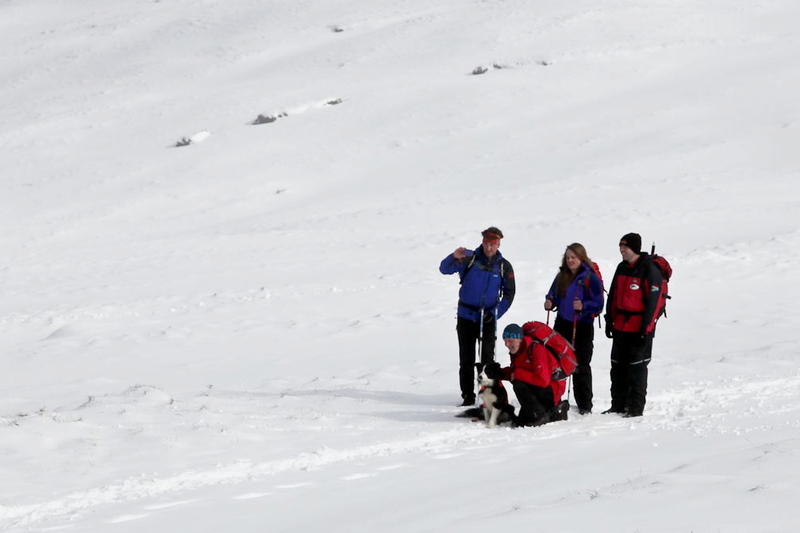 However, most people do it the other way round, and after treading virgin snow for most of the way up we finally started meeting other parties coming down. 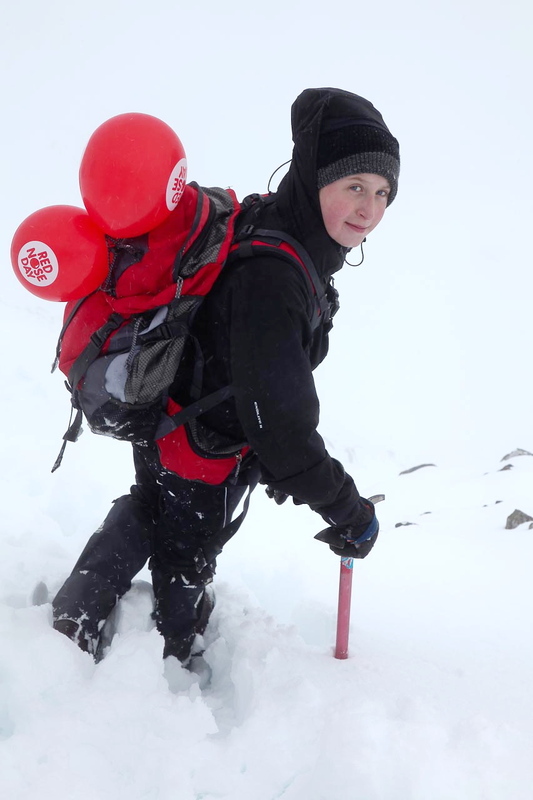 In summer it’s sometimes amazing how unprepared some walkers are for a mountain day, but today everyone was well kitted out, including the young guy we met who was supporting Red-Nose day, with red balloons on his pack. 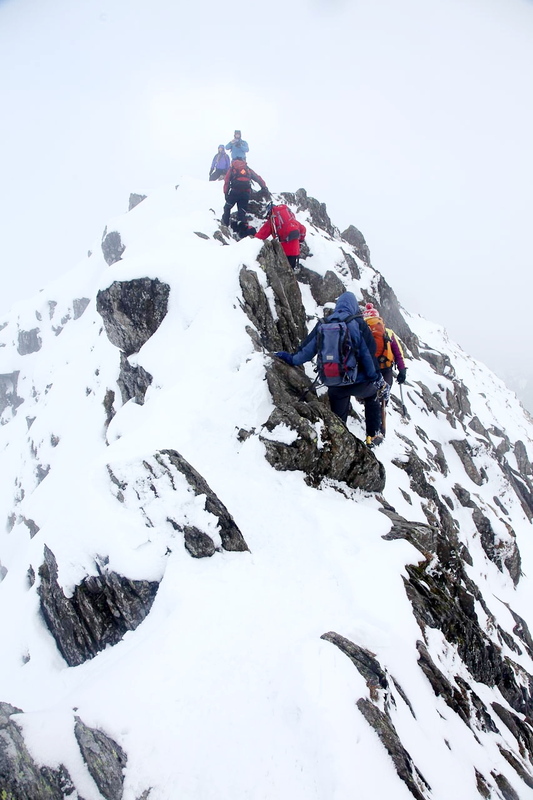 ‘Cheesy’ photograph at the top of Swirral edge – Just got to do it!! Then, suddenly, it was flat instead of up! 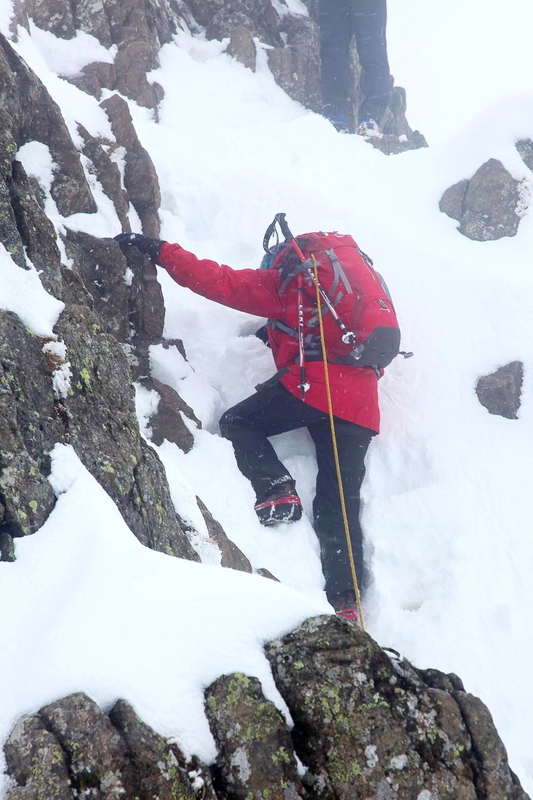 The hard icy névé that frequently forms at the top of Swirral Edge was banked up with deep fresh snow that posed no difficulty at all. 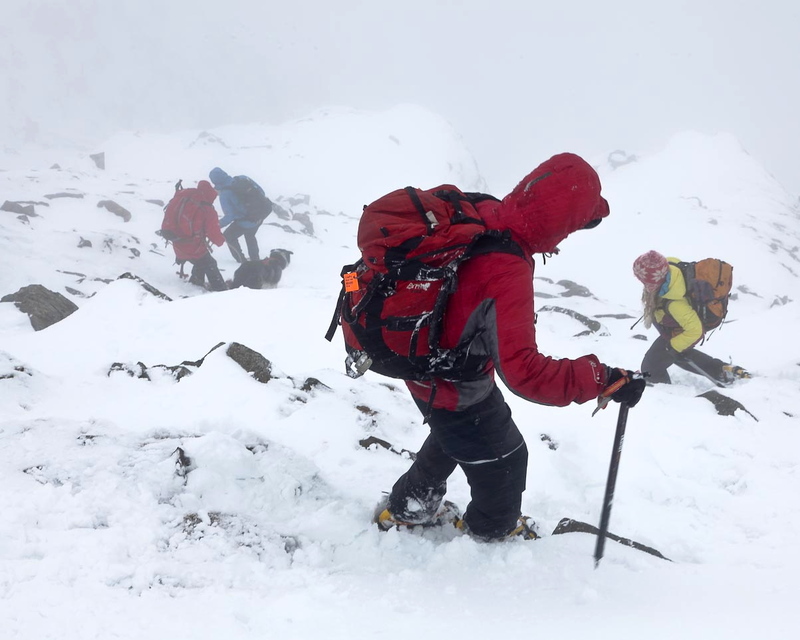 Four of us wore Kahtoola Microspikes for most of the day, with the other two in crampons – the Microspikes probably had the edge in the soft snow conditions. A ‘cheesy’ photograph was demanded at the top of the edge, then after a swift lunch break it was time to go down. Going ‘against the flow’ of most of the traffic meant that we had the advantage of descending the tedious slope at the summit end of Striding Edge. 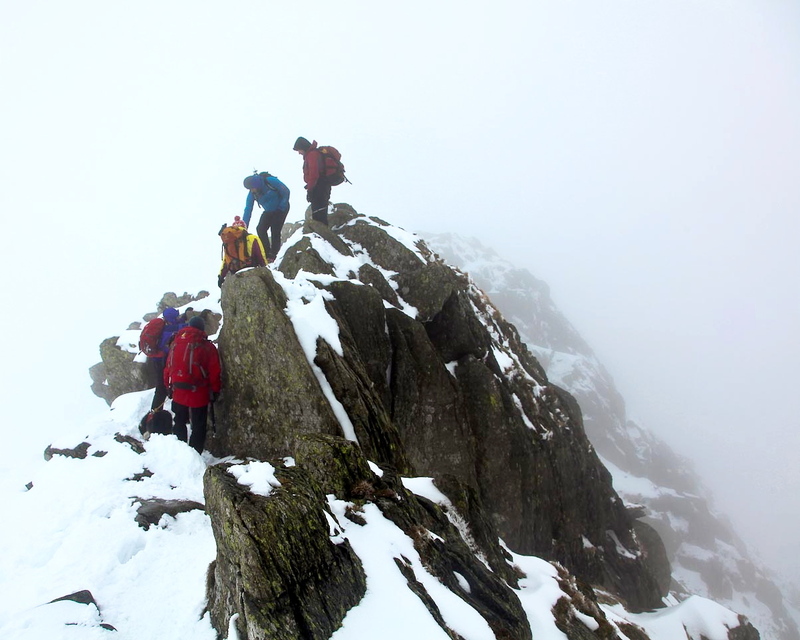 Joe was now in pole position, and diverted round the rock pinnacle at what was (for us) the start of Striding Edge. 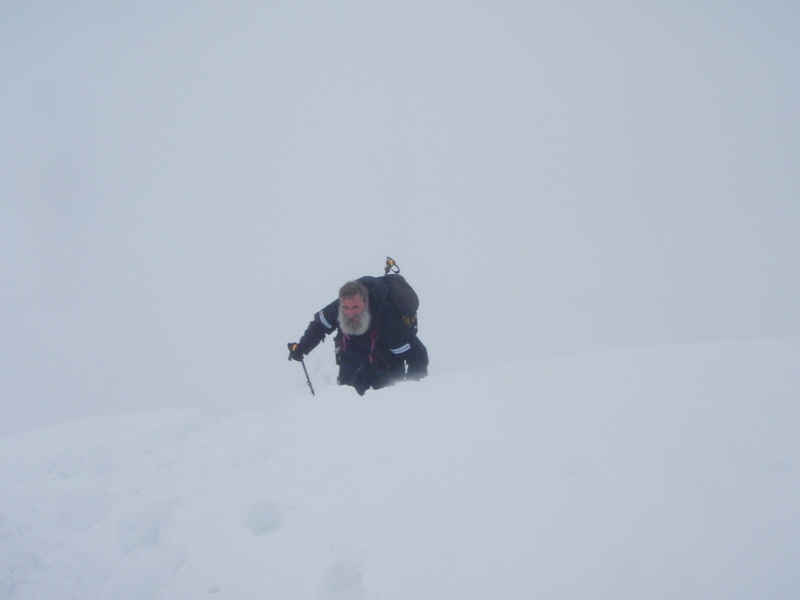 Beyond there, the short rock chimney known as ‘The Bad Step’ was completely banked out with snow – I already had ‘Mist’ on a rope and harness because of the danger of her dropping through a snow cornice, and a ‘pull’ soon had her up the five metres of steep snow. 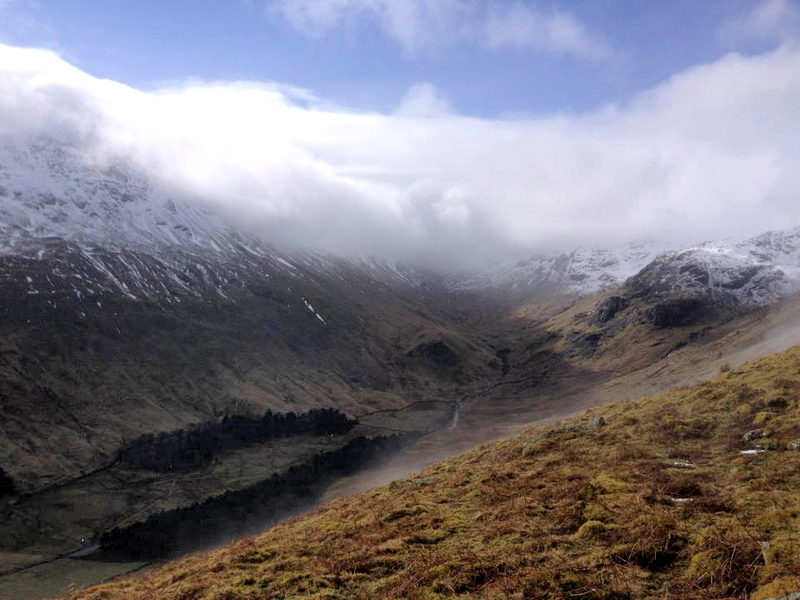 The remainder of the ridge passed without incident, the usual big drops hidden in the murk. And then it was all over! The ridge gets wider and wider, leading back to Hole in th’ Wall. From there a steady descent down Birkhouse Moor took us back to Glenridding, just in time for the Wales v England match on the TV in the Traveller’s Rest. After a quick cider, I had to set off to travel back to North Wales. The snow-free road I took over Kirkstone Pass was closed six hours later by heavy snow fall – it looks as though winter will be around for a while longer. This entry was posted in 2. 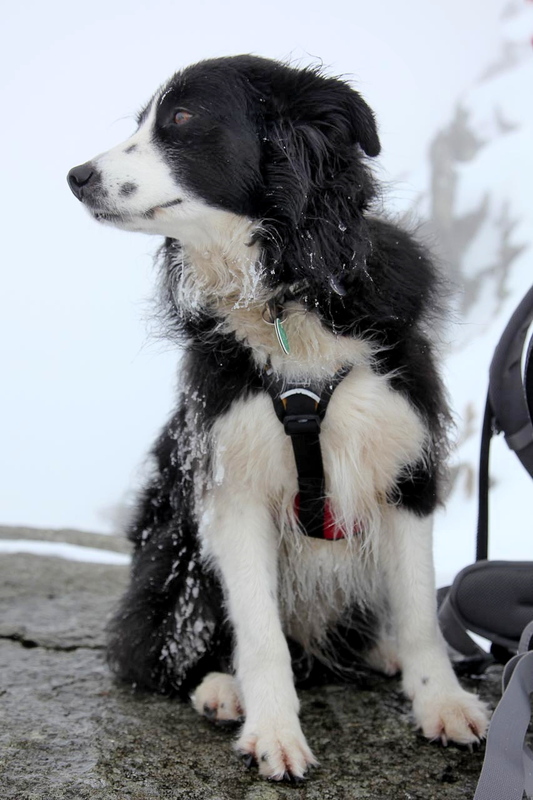 Lake District and tagged Border Collie, Helvellyn, hillwalking, mountain rescue, mountaineering, mountains, photography, snow, winter. Bookmark the permalink. Fantastic day out there, then! Fantastic photos and I particularly love that one of Mist in mid-air! Thanks Chrissie – the vis was a bit disappointing as you can see in the pics, but a good day out. Glad to see you and Mist enjoying the snow (I’d quite like it to go away now though!). Love the pics, despite getting vertigo just looking at them! Thanks Yasmine. I quite like playing in the snow, but the bitter east winds over the weekend take a bit of the gloss off it! Brilliant! Having done much the same route as you last Spring it was nice to see it in snow. 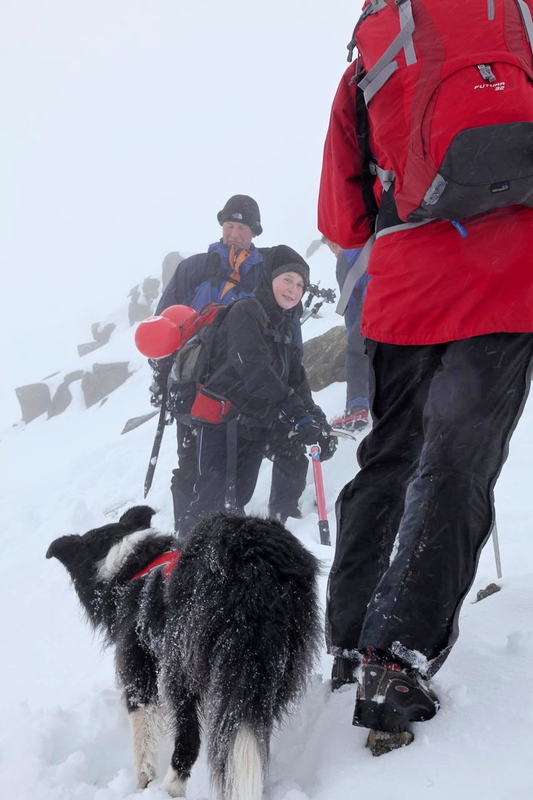 I haven’t done too much walking in snowy conditions so was very interested…great photos and nice to see Mist is coming along nicely on her course! Well done! 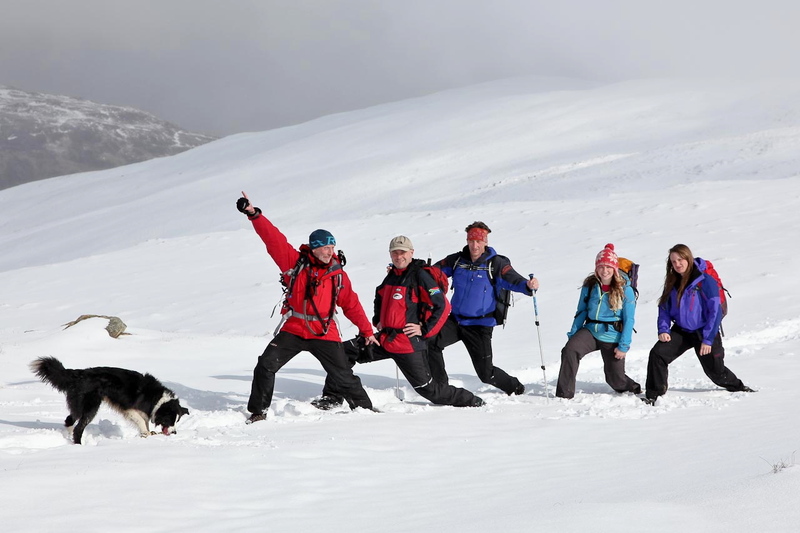 Thanks SP – if you fancy some snowy walks just stick around for the next few months, the way that the weather patterns seem to be shaping up !! Great stuff, reminds me of my early winter walking there. It’s an area I know well John, but one I return to frequently. 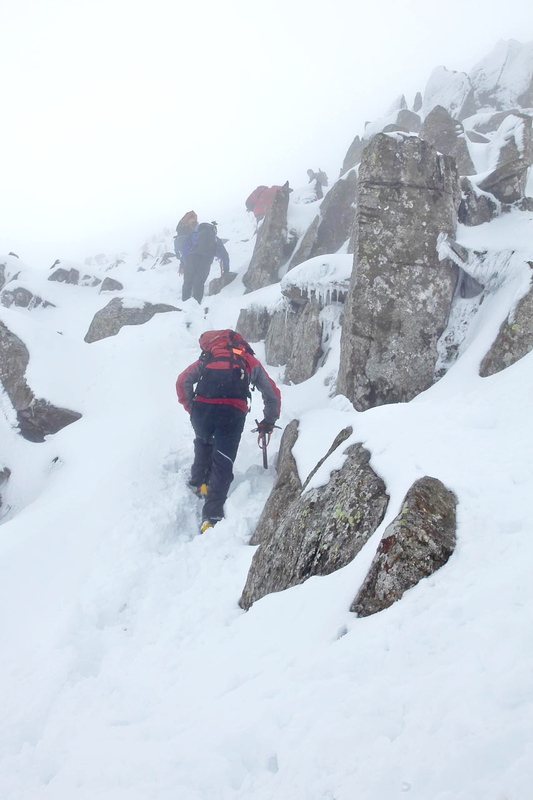 What a great post and what a treat to do a route like this in full winter conditions. Excellent images especially of Mist in full flight. This was the weekend before last, right? So since then you’ve had the lion’s share of yet more snow. It doesn’t look like it will be gone quickly either. Thanks for that Andy, it was a great day out. More snow indeed, especially Northeast Wales. I’ve seen one image of a local mountain rescue Landrover in a gap cut through a snowdrift by a ‘blower’ – the drift is almost twice the height of the vehicle! With the current cold spell, the snow will be around for a while without doubt. Great post Paul [as always]. How difficult would it be for a SR dog novice like me [I have never taught a dog anything but walk off lead, sit, stay & here….] 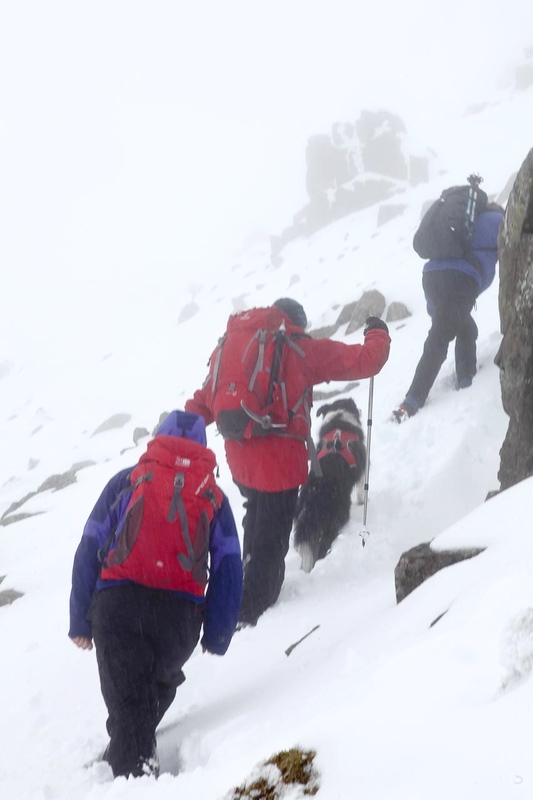 to get into dog search & rescue? Where do you start? Blimey, how long have you got?!! 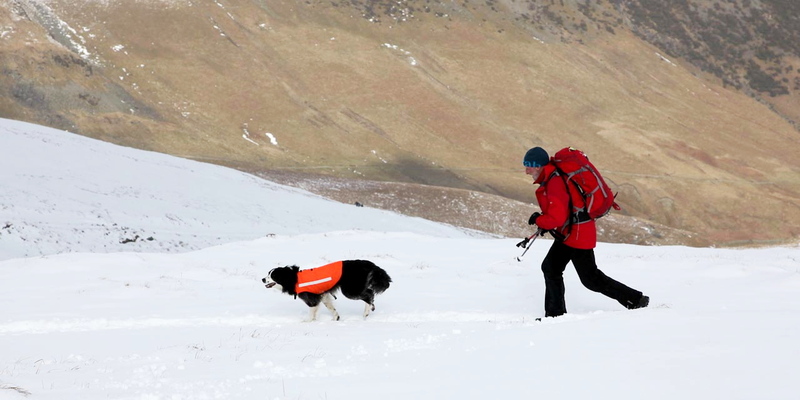 I’ll email you, then we can carry on the conversation – If anyone else reading this is interested in training a search dog, or in mountain rescue, follow the links on the right margin of the blog. Definitely not a route for me in winter! I’d be terrified – I usually stick to the western side in those kind of conditions. That chimney on Striding must have been tricky? Great action photo of Mist on the run-out! Some other lovely shot of her as well. My cheap(ish) digital camera can’t cope with fast moving objects like Border Coliies, but my mate John has cameras that can probably make toast as well as take pictures. I’ve still got my film camera, as I think I’ve mentioned to you before – an Olympus OM2, with extra lenses, cutting edge when it came out but now found at bargain prices on Fleabay. I really must use it more this year. I think, for digital, if you want quality you have to spend a lot of money – that’s what I’m finding with my cheap one. For my film camera, it was really cheap but is still excellent. I suppose it helps that the cheap film camera is an SLR though. I find it really, really hard to see what I’m taking with the point-and-shoot digitals (as is Richard) – we just point and click and hope! A five star post and another great set of photos – I certainly got a laugh out of the first one. What a right set of posers! Mist really looks the part and seems to be totally focused on the job in hand. 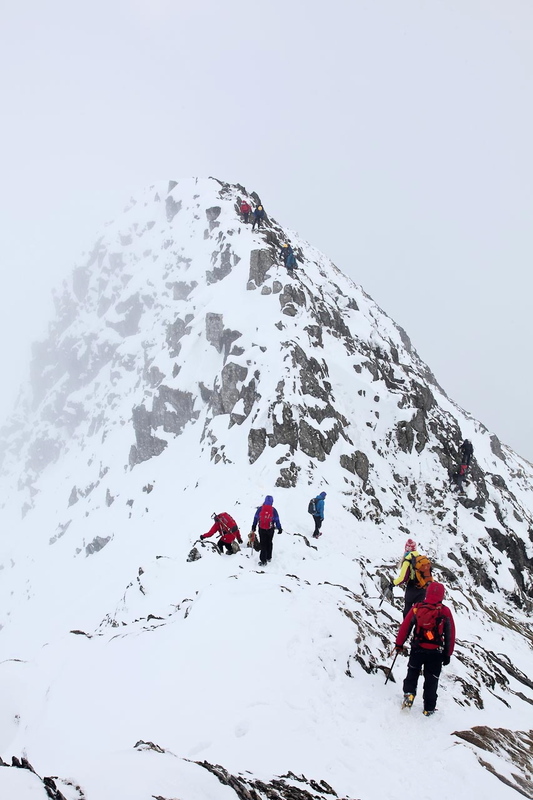 Very pleased to hear that the other walkers you met were well prepared for the conditions – it must be depressing when you see folk taking risks, though no one can afford to by smug however well equipped. That east wind is something else – even a walk up ‘t road the other day had my fingers numb in minutes. Thanks for the kind words Anita – bunch of posers indeed! I’ll be glad to see the end of that east wind – it’s been too blowy this last few days to make a hill day inviting. For them thats interested in the nerdy side cameras used are canon EOS 5D and 5D Mk2 with 24-105L and 17-40L lenses usually 100/200 asa f12 and auto speed in the bright light compensating with up to +/- one stop if time frame allows some “messing about to get it right” usually the subjects (Paul excepted) dont want to stand/hang around in the cold. That looked like a lot of fun and like a wonderful hike! I must admit it looked quite scary too!